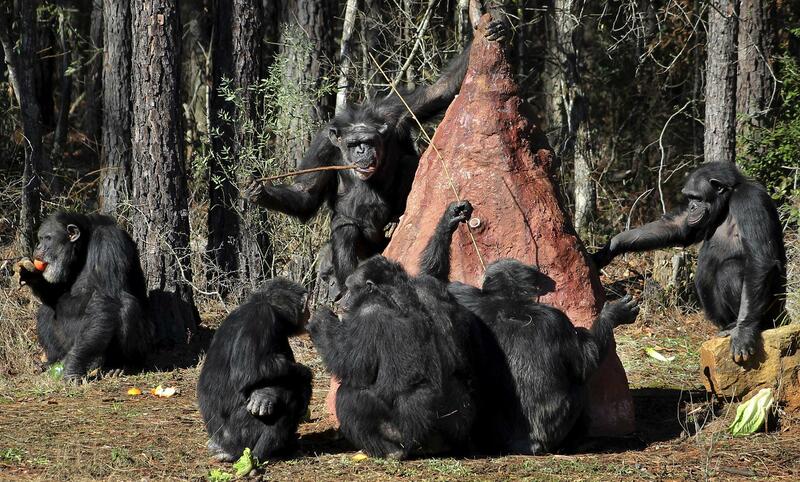 Chimps use sticks to poke into a mock termite mound to taste a sweet substance placed in the mound by keepers at Chimp Haven in Keithville, La. Today, caretakers say, more chimps in the U.S. live in accredited animal sanctuaries than in research facilities. Queenie arrived at Chimp Haven in 2014. The private, nonprofit sanctuary has cared for well over 300 chimpanzees since its inception, and is currently home to more than 200. "And Marie loves to groom with Sarah, and follows her around and gives her lots of attention. And we're seeing Sarah play with her and just being much more sociable," says Amy Fultz, who studies animal behavior and co-founded Chimp Haven in 1995. "At 59, that's a really cool thing to be able to see and watch." Their friendship shows that even very old chimps can grow and change. But it's more than just a big deal for Sarah Anne. The arrival of Marie, along with some other chimps from a research facility in New Mexico, tipped the scales in terms of where most chimps live in this country. "There are more chimps in accredited sanctuaries than there are in research facilities now," says Rana Smith, the president of Chimp Haven. That means the retirement of research chimps has reached its endgame — and this final stage is proving to be unexpectedly challenging. In 2015, the National Institutes of Health announced that the era of chimp biomedical research was over, and that all of its chimps remaining in research labs — nearly 400 at the time — would gradually be transferred to Chimp Haven. The trouble is, more than half of NIH's roughly 270 chimps remaining in labs today have chronic health conditions that could be exacerbated by the stress of the move. "The chimp population that is supported and owned by NIH is quite old, and they acquire a lot of the same problems that we do: heart disease, kidney disease, diabetes," says Dr. Jim Anderson, an NIH official who is managing chimp retirement. "There may be a few that are just too frail to move. And how do you approach that? How do you think about that?" Earlier this year, an NIH advisory group recommended that all chimps should go unless the relocation is "extremely likely to shorten their lives." And if there's any dispute about whether or not a chimp is healthy enough to go, the advisers said that independent veterinarians should weigh in. The NIH accepted public comments on these recommendations through mid-August, and the agency's director is expected to soon announce a decision about how to move forward. The stakes are huge, both for the chimps and for the people who care for them. "These people have been with these animals forever, and the bond is a very long one and it's very deep," says Robert Lanford, director of the Southwest National Primate Research Center at the Texas Biomedical Research Institute in San Antonio. He notes that many of the chimps were born at the center, and that their caretakers are like family. "In the beginning," he says, "the vast majority of our behavioral and veterinary staff did not want to see any of the animals moved." Over time, he says, they've come around to the idea. Now Lanford and others at his facility are in favor of sending the chimps to sanctuary — at least, most of the chimps. The NIH has about 80 chimps here, and Lanford says 7 of them need to stay. "Behaviorally, emotionally and physically, these animals have severe problems," says Lanford. "We have an animal that's blind that is taken care of by its two cagemates. How do you recreate that at Chimp Haven? I'm not criticizing Chimp Haven — it's just that there are some animals that should not be moved." Lanford believes the priority should be to relocate NIH chimps with early stage disease to the sanctuary, so they can make the transition while they're still healthy enough to do so. He thinks that should happen while the deliberations about the most at-risk animals continue. "Don't take the most at-risk, unhealthy animals and move them, because we're still debating," he says. "Don't take your healthiest animals and move them, because they can be moved later. Take the animals that have moderate disease and move them today — because if you wait, they will have more advanced disease and they'll be at high risk." His staff knows how stressful the move to a new home can be. Maribel Vazquez, a behavioral scientist and caretaker, has traveled with chimps previously transferred to Chimp Haven, to offer emotional support. "Even the ones that are very healthy — even the ones that are very strong — it's very scary," says Vazquez. The drive to the primate sanctuary in Louisiana takes hours, and, for safety reasons, the chimps have to be alone in small cages. She can't explain to them where they are going or what will happen. "And once you get there, they all have to come out of the van. And they don't know," says Vazquez. "There is a lot of crying. There is a lot of anxiety." One terrified chimp refused to take important medicine. "There are individuals that I think would have a really hard time and might not even make it through the transport," says Vazquez. Her colleague Sabrina Bourgeois agrees. "I do worry about some of them," she says. "I think people hear the word 'sanctuary' and they think every animal is going to just be so happy." Bourgeois, a research associate at Southwest, thinks for some of the chimps, the transition could be traumatic, especially ones who are strongly bonded to their caretakers. The cages and enclosures at this research center don't look all that different from some at Chimp Haven. But the chimps at Southwest live in much smaller groups — maybe just a pair, or three or four together, while Chimp Haven has groups as large as 21 chimps. What's more, the Texas research facility doesn't have the natural environments for chimps that the 200-acre sanctuary in Louisiana has available, such as small forests bordered by moats. Because the Texas facility has thousands of baboons and monkeys, however, keeping a small number of elderly or frail chimps around wouldn't be difficult, in terms of staffing or care. That's not the case at the Alamogordo Primate Facility, which houses more than 60 NIH chimps at a U. S. Air Force base in New Mexico. As its chimps get transferred to Chimp Haven and the numbers of animals dwindle there, it will become increasingly expensive to maintain the necessary veterinary and behavioral staff; the facility has no other primates. Anderson says that NIH officials have considered the possibility that Alamogordo might end up with a few high-risk animals left, and says the government will make sure that the chimps can stay in-place for as long as needed. "We would continue to support a facility to provide excellent care for them even if there were small numbers," says Anderson, who notes, "if we've deemed them too dangerous to move, I'm not sure what the option would be." The risks of moving a chimp always have to be weighed against the possible benefits, says veterinarian Raven Jackson-Jewett, at Chimp Haven. "Risks are inevitable. We know, undertaking this process of chimpanzee transport, we're never going to have a risk of zero," says Jackson-Jewett. "The benefit is what we can afford them in a life of sanctuary." To Fultz, the ideal life for a chimp involves choices and novelty, and the Chimp Haven is set up to provide that. "Chimp Haven really believes that only the frailest of chimps are those that should potentially remain," says Fultz, because the primate sanctuary has a track record of being able to care for animals with physical and emotional problems that might have raised questions about their ability to start a new life. As an example, she cites Joseph, a 38-year-old chimp who spent more than 10 years living alone in a cage. "We were able to integrate him into a group of over 10 chimpanzees," says Fultz. "He's done wonderfully, socially. He has group mates that he plays with now." 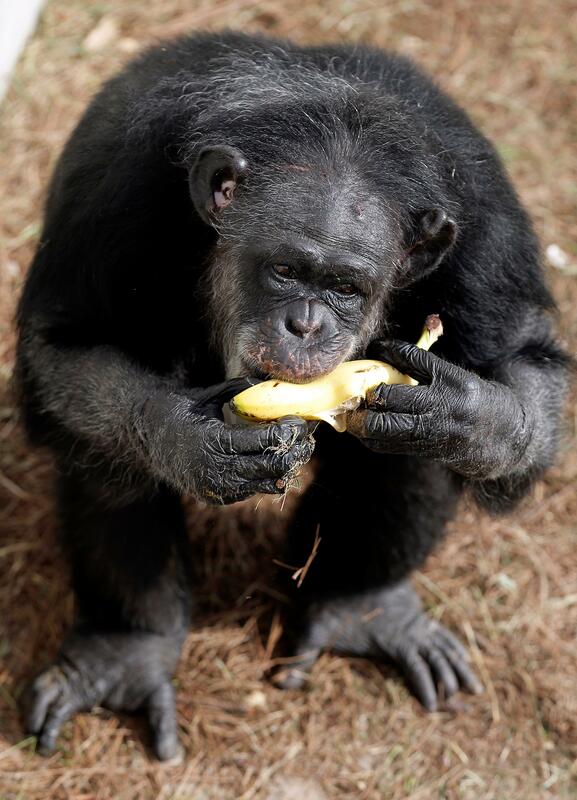 In the woods near Shreveport, La., there's a sanctuary for chimpanzees. CHANG: These chimps once lived in research facilities. Medical research on chimps has stopped in this country, and now all of the government's remaining lab chimps are supposed to move to this sanctuary. The trouble is a lot of the animals are elderly, and some are fragile either emotionally or physically. NPR's Nell Greenfieldboyce reports there are tough decisions ahead about what's best for them. NELL GREENFIELDBOYCE, BYLINE: The federal sanctuary is called Chimp Haven. It's already home to more than 200 chimps. So who are all these chimps? GREENFIELDBOYCE: Let's quiz you right now. FULTZ: OK, we'll, I'm going to start with Passion, who has the little one on her back right there (laughter). GREENFIELDBOYCE: Amy Fultz is one of the founders of Chimp Haven. FULTZ: The gray one kind of coming to the left is Flora. Natalie's walking up at the front. GREENFIELDBOYCE: We're watching a group of 21 chimps roam around a small forest of pine trees. This sanctuary covers 200 acres and has a variety of enclosures. The chimps can be rotated from place to place. GREENFIELDBOYCE: We go see a group of 15 that's hanging out around some wooden climbing structures. GREENFIELDBOYCE: Some are stomping around, having a spat. The arrival of breakfast distracts them. Fultz shouts a chimpanzee food bark. GREENFIELDBOYCE: She starts to throw bananas and green peppers to chimps like Jacob. FULTZ: Who is our oldest male. And you can kind of see he looks arthritic. GREENFIELDBOYCE: Jacob is around 58 years old. He was captured from the wild in Africa when he was very young. Fultz says at one point, he was used in research on prions, the kind of infectious agent thought to cause mad cow disease. Scientists have done all kinds of experiments on chimps. They've exposed them to radiation, put electrodes in their brains. They've infected them with viruses. Animal welfare advocates said this was immoral given that chimps are human's closest relative. And a few years ago in part because of public pressure, the National Institutes of Health announced that chimp research was coming to an end. All of its chimps would be retired to the sanctuary. More than 250 chimps are still at research facilities, and they've been gradually moving to Chimp Haven. Fultz used to work at a research facility. She says some of the chimps she cared for there clearly recognized her when they arrived at their new home, like Hamlet, who was used in research on hepatitis. FULTZ: He's definitely one of those chimps that I've known for longer than I've known my children. I've known Hamlet for over 20 years. GREENFIELDBOYCE: Each chimp is different, and although the NIH is trying to do right by these animals, knowing the right thing to do isn't always easy. To understand why, I went to Hamlet's old home. The Southwest National Primate Research Center is at the Texas Biomedical Research Institute in San Antonio. Big fans are blowing near some chimp enclosures. It's a hot day. ROBERT LANFORD: It's a little warm. They're not as active as they normally are. GREENFIELDBOYCE: Robert Lanford is director of this research center. He points to one chimp using a tool. LANFORD: This guy here is using a branch to get treats out of that feeder down in there. GREENFIELDBOYCE: These cages don't look all that different from some of the ones I saw at Chimp Haven, although there's no forests here. The chimps also live in much smaller groups, maybe just a pair or three or four together. Lanford says many of these chimps were born here. It's their home. The people are like family. LANFORD: These people have been with these animals forever. And the bond is a very long one, and it's very deep. In the beginning, the vast majority of our behavioral and veterinary staff did not want to see any of the animals moved. GREENFIELDBOYCE: He says over time, they've come around to the idea. Now they're in favor of sending the chimps to sanctuary, at least most of the chimps. The NIH has about 80 chimps here. Lanford says seven of them need to stay. LANFORD: Behaviorally, emotionally and physically, these animals have severe problems. We have an animal that's blind that is taken care of by it's two cage mates. How do you recreate that at Chimp Haven? And I'm not criticizing Chimp Haven. It's just that there are some animals that should not be moved. GREENFIELDBOYCE: His staff knows how stressful the move can be. Maribel Vazquez is a behavioralist and caretaker. In the past, when retired chimps have traveled from here to the sanctuary, she's gone with them to offer emotional support. MARIBEL VAZQUEZ: Even the ones that are very healthy, even the ones that are very strong - it's very scary. GREENFIELDBOYCE: She says the drive takes hours. For safety, the chimps have to be alone in small cages. She can't explain to them where they're going or what will happen. VAZQUEZ: And once you get there, they all have to come out of the van. And they don't know. And so there is a lot of crying. There is a lot of anxiety. GREENFIELDBOYCE: One chimp was so terrified she refused to take important medicine. VAZQUEZ: There are individuals that I think would have a really hard time and might not even make it through the transport. GREENFIELDBOYCE: This is the problem that the NIH is struggling with. More than half of the NIH chimps still at research facilities have chronic health issues that could potentially be exacerbated by stress. Jim Anderson is an NIH official who's been managing the retirement of the chimps. JIM ANDERSON: The chimp population that's supported and owned by NIH is quite old. And they acquire a lot of the same problems that we do - heart disease, kidney disease, diabetes. There may be a few that are just too frail to move. And how do you approach that? How do you think about that? GREENFIELDBOYCE: Earlier this year, an NIH advisory group recommended that all chimps should go unless the stress is, quote, "extremely likely to shorten their lives." And if there's any dispute about whether or not a chimp is healthy enough to go, it said an independent veterinarian should weigh in. The NIH director is considering all this and is expected to soon announce a decision about how to move forward. The stakes are huge for both the chimps and the people who care for them. Back at Chimp Haven, Amy Fultz says the risks of moving a chimp have to be weighed against the possible benefits. FULTZ: There are chimpanzees that maybe we might have had some question about. But once they arrive here, because we can cater to those individual needs, they can be huge success stories. GREENFIELDBOYCE: We walk by one cage that has several chimps. FULTZ: This group has one of our oldest female chimpanzees. Sarah Anne is 59. GREENFIELDBOYCE: Sarah Anne was raised in the home of a language researcher and taught to use symbols for words. She has her own Wikipedia page. She was recently introduced to some chimps sent from a facility in New Mexico, including Marie. FULTZ: And Marie loves to groom with Sarah and follows her around and gives her lots of attention. And we're seeing Sarah play with her and just being much more sociable. And at 59, that's a really cool thing to be able to see and watch. GREENFIELDBOYCE: Marie's arrival wasn't just a big deal for Sarah Anne. It was a milestone in another way. Marie came in a group of chimps that tipped the scales so that now more chimps in this country live in a sanctuary than a research lab. Nell Greenfieldboyce, NPR News. Transcript provided by NPR, Copyright NPR.